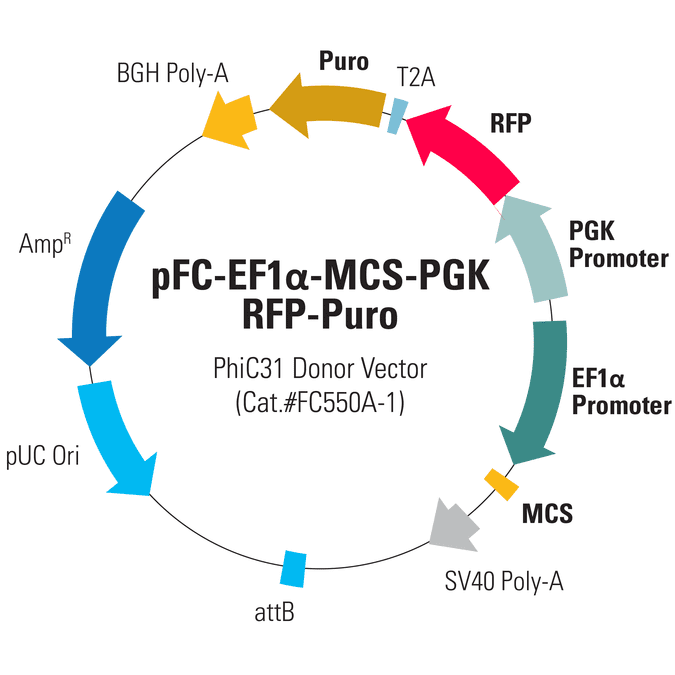 Combine the advantages of the PhiC31 Integrase System with a bidirectional promoter format for your genome engineering projects with the pFC-EF1α-MCS-pA-PGK-RFP-T2A-Puro PhiC31 Donor Vector. Simply co-transfect with the PhiC31 Integrase Expression Plasmid (Cat.# FC200PA-1) and select for integrants using puromycin resistance and imaging for RFP fluorescence. The bidirectional promoter configuration takes advantage of the natural bidirectional activity of the PGK promoter. In addition to enabling coordinated expression of your gene-of-interest and a marker, this divergent configuration is both stable and resistant to silencing in embryonic stem (ES) cells, trophectoderm stem (TS) cells, and extra embryonic endoderm (XEN) stem cells1.